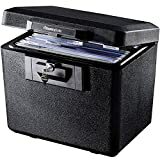 Security lock boxes provide a safe place to keep your cash, sensitive documents, and other portable assets of great value. It’s no surprise that some people have even turned it into their home bank unit. Security lock boxes are not made the same. Each manufacturer has different smart features and technology geared towards providing a high level of security and protection. Choosing the right security lock box is an uphill task if you don’t know what to look for. Well, let’s break it down for you. Give a top priority to the level of protection the box has to offer. For instance, take a look at the fire and water resistant ratings. Don’t forget about storage space since you want your items of value to fit without a hitch. The type of access and smart features should also be factored in. 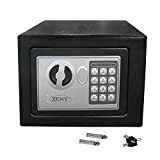 Well, here’s a roundup of the best security lock boxes that make a reliable covert for your valuables. 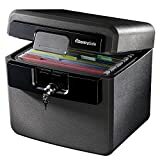 This is a compact security lock box providing 0.5 cubic feet of storage. The box has an interior shelf that can be adjusted to the size of the items you plan to store. This box is made of solid steel resistant to prying and scratches. The floor is carpeted to create some form of soft cushioning that protects delicate items against scratches or damage. This box has a reprogrammable digital access with 2 override keys in case you forget your password. This safe gives good protection against water and fire while keeping your important documents secure. It’s built to withstand up to 1/2 an hour exposure to temperatures of up to 1550 degrees Fahrenheit. The box can be submerged for up to 72 hours without letting in water. It has 0.65 cubic feet of space enough to accommodate up to 40 standard hanging folders. Built-in straps hold the folders securely in place. This box has a lock system to keep off unauthorized entry. This is a combination security lock box. It’s an extra-large box providing 1.23 cubic feet of storage. An adjustable shelf and a door pocket to keep your documents and personal items organized. This safe is designed to provide a high level of protection for those things that matter to you. It seals off water for up to 24 hours when fully submerged. This safe is made of steel. This safe box is made of solid powder-coated steel that is sure to last a lifetime. The box has a PIN lock system and an override key that comes in handy in case you forget your PIN. You can choose from a 3 digit to 8 digit PIN. The box has a soft carpeted floor on the inside bottom to safeguard delicate items. Pre-drilled holes and bolts are included in case you want to anchor the box on a sturdy surface, such as a wall, floor, or cabinet. First Alert 2602DF chest keeps your documents and media devices safe and well protected. The chest is designed to resist water and fire. It’s fire safe in temperatures of up to 1500 degrees Fahrenheit for 30 minutes. This security lockbox keeps out water even when fully submerged for hours. 4 to 8 digit passcode is used for access. There’s an emergency override key to keep you from getting locked out in case you forget your password. This chest has 0.39 cubic feet of storage space enough to fit standard letter-size files laid flat. 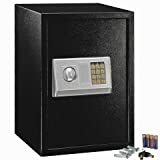 This is a budget-friendly safe with good security features that surpasses its price tag. The safe is made of steel and has a double-wall construction for great thermal insulation properties. It can withstand up to 15 minutes exposure to temperatures of 750 degrees Fahrenheit. This chest is designed to fit 9 x 12-inch documents laid flat. The safe has a security lock with 2 keys. Two carry handles make it much easier to carry around. 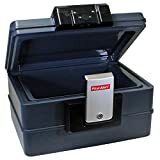 This large security lock box safeguards your money, jewellery, and a firearm. The safe has a 2mm thick wall made of solid steel. Accessed is allowed via a digital pin or override key. You get a timeout in case you make 3 wrong entries. The safe opens up to a large interior that has a soft carpeted floor to safeguard your delicate items, such as jewellery. You can choose to mount this safe on a wall, floor, or cabinet. This is a heavy-duty security safe constructed of solid steel. It’s a sturdy,pry-resistant safe that comes with concealed hinges to provide an extra level of security. The safe opens via a digital PIN code. There’s a password reset button positioned at the bottom. The safe triggers an alarm in case of 3 failed attempts. 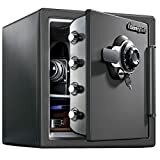 This safe is available in three different sizes of 0.17, 0.3, and 0.5 cubic feet. 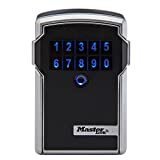 Master Lock is among the new era of safe boxes out there. This security lock box is built to provides great convenience. Forget about having to remember any combinations. You can unlock it from your smartphone or use a backup numeric code in case you don’t have access to your smartphone. The safe has a built-in Bluetooth technology that lets you share access on a temporary or permanent basis. Any tamper alert or low-battery alert is directly sent to your smartphone. The safe is designed to install permanently on flat surfaces. This security lockbox keeps your files and media devices safe. 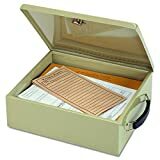 It has spacious storage of 0.61 cubic feet to fit your letter size hanging files. The safe has been proven to withstand up to 30 minutes of fire raging at 1550 degrees Fahrenheit. It completely seals off water to ensure the inside remains dry. The safe has a private key lock system to ensure your items are kept secure.